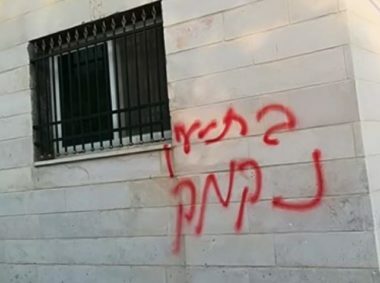 A group of illegal Israeli colonialist settlers infiltrated, on Friday at dawn, into a Palestinian village near the West Bank city of Bethlehem, punctured tires of several cars, and wrote racist graffiti. Media sources said the Israeli assailants infiltrated into al-Jab’a village, west or Bethlehem, before puncturing the tires of many cars, parked on the sides of roads in the community. The graffiti was written on walls of a number of homes and the local mosque, in addition to several cars. The attack is the latest of ongoing violation carried out by the colonialist settlers, illegally living on Palestinian lands, in several parts of the West Bank.